Here are a few ideas that think about the environment, eliminate needless ‘gift giving waste’, and hold a special place in the hearts of the receiver! It's a New Year, and according to Work is Changing.ca, large company capitalism will continue to grow and shape the face of what work will look like well into the year 2030. While these massive companies are 'king', it's also noted that community businesses will prosper over the next 20+ years. It's more important than ever for small businesses to position themselves effectively in this market. One notable way to gain a foothold is through effective branding. Our process begins with the granddaddy of branding - the logo. It's important to have a professional logo that is used across all of your marketing channels. According to the Small Business Resource Centre at Deluxe, people are more likely to purchase from a business that appears polished and legitimate. Using a custom, standardized company logo will help you build this trust. We sit down with you to chat and settle on some keyword defining attributes of your business. Is your brand loyal, passionate, precise or innovative? The more we learn about you, the better. Next, we get to work on creating your unique logo. We try monograms that highlight the initials of your company name. Next, we see your company spelled out in a wordmark. Finally, we create symbols that speak your message and incorporate them. After we're done, we pick the best of the best and begin to shape your final look. According to 99Designs, the six key components of any style guide are: logo, typography (fonts), colour palette, brand story, voice and imagery. We agree. You'll walk away from the branding process with a typed, professional document that outlines each of these areas. It's especially handy if you work with different designers or do some graphics in-house. Having the pertinent information handy will make it easier for you to deliver a consistent brand message through the words you write, the colours you choose, and the imagery you feature. It's not news to us business owners that the difference between a 20-minute project and a 1-hour project is often times good organization. We'll send you logo files that are ready to use in print, online, and in advertisements, all bundled with a file directory so you know which logo version to use and where. Once the project and payment are complete, you have full ownership of your new logo. We won't ever duplicate it for another client. We may ask to show it off on our portfolio, but that's just because it will look so cool and we want to help you show it off! Once the logo is complete, you're ready for some other marketing materials that compliment the new look. Business cards, brochures, presentation folders and postcards are just a few ideas to get you started. We can also source stock imagery for you to use on your social media profiles, or help create a tagline to summarize your message. Working with one designer for all of your branding needs can have many advantages. Perhaps the most important one is a cohesive look to share with your audience, time and time again. Happy brand building and all the very best for a prosperous 2018! Every year in October we celebrate Small Business Week. As a new business owner, I attended as many events as I could. Among them was a keynote seminar put on by Winterdance Dogsled Tours and the Haliburton Highlands Chamber of Commerce. This company’s home base is nestled in the beautiful hills of the Haliburton Highlands. Winterdance offers one-of-a-kind outdoor experiences. Visitors come from all over to feel the thrill of dog sledding with some of the 150 purebred Siberian Huskies that live on site. (For those who haven’t tried, I can say from experience that it’s a magical day and well worth your investment). So, what can these loveable pups teach us about business? It turns out that there’s an uncanny resemblance between working with a team of Huskies and with a team of people. 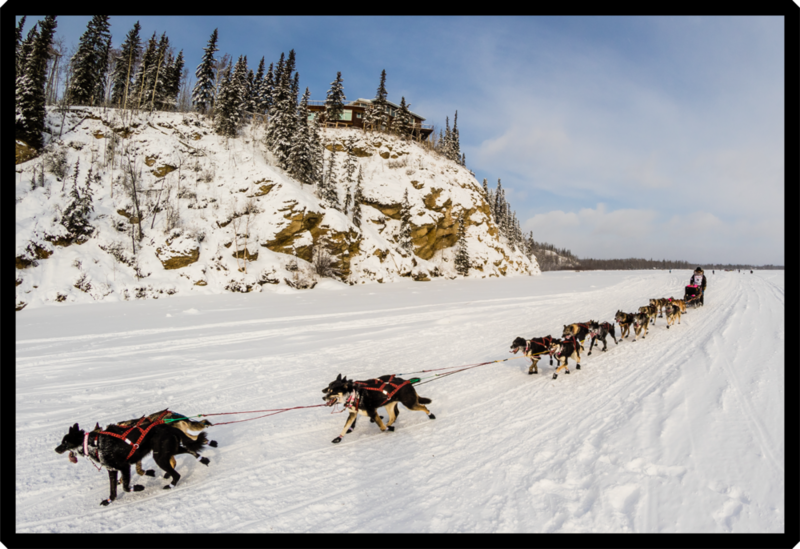 Mushers who have taken part in long-distances races like the Iditarod will tell you that team synergy is a must. Dogs have been known to lie down and refuse to move when they sense insecurity or uncertainty. When the leader is stressed or feeling conflicted, the dogs are not keen on moving forward until things go back to normal. On human teams the sentiment is the same. We may not literally lie down at our desks, but we tend to detach from our work in times of struggle. If we feel out of touch or mistrusting of our leader’s direction we struggle to move forward. On the other hand, teams brimming with trust move freely and confidently into the future with confidence. When you have as many as many as 16 Huskies depending on you, that’s a lot of hungry mouths to feed. To make camp every night each of them need booties to protect their paws, protein to eat, water to rehydrate, and fresh straw to sleep on. The musher takes care of these chores in sub-zero temperatures, without complaint, and all before he’s had his own supper. In long distance dog sledding, it’s often the musher that the support staff worries about. They know the dogs will be very well taken care of, but special attention must be paid to the leader’s health and wellness. It’s easy to overlook this when you’ve got so many other things to take care of. In business life the balance must also be struck. The boss will often ‘eat’ last as a way to signify their appreciation for their team. However, burnout and stress can stop the leader from doing what he or she does best, so it’s important to nurture them too! On a dog sled team, a pup can be in one of four positions: a lead dog at the front of the pack, a swing dog, a team dog in the middle, or a wheel dog which is nearest to the musher. The placement of dogs is based on their work ethic and personality. Developing a keen knowledge of the individual is absolutely crucial for placement. Hank from Winterdance told us about one of his “rocks”. He was the best wheel dog. He could steer the sled on his own and Hank would never worry about him taking the team off course. However, when given his shot in the lead dog position, he did not perform at all. It turns out, his spot was right beside Hank all along. On human teams we often see the same. I talk about it in my last post when mentioning unique ability. The idea is that an individual is given responsibility for tasks that he or she thrives at. Rather than expending extra energy and even causing stress trying to do something we’re not great at, unique ability tells us it’s okay to find our groove and stick to it. That doesn’t mean we shouldn’t all be given the chance at the ‘lead dog’ position, but some may find a better fit somewhere else. I am thankful to have seen this presentation. It prompted me to look at complex, dramatic team conflicts in a new light. As a takeaway, I’m going to try and remember to take a simpler approach to teamwork. I’m going to remember the dogs whose intentions are simple and awe-inspiring – to run across rugged terrain, as a team. I’m also going to remember the dependable musher who cares for his team deeply. If you are interested in learning more about this presentation, have a look at Winterdance’s Keynote Speaking page. As small business owners, it's tempting to look outward for trends and tips. It's our way of contemplating what tactics, messaging and corporate culture is acceptable in today's business environment.